Soaps well! Does discolor to a dark brown. Still not bad but not what I was hoping for - my phthalate free sandalwood FO hunt continues. More of a perfume with the vanilla mixed in. I smell more vanilla perfume. 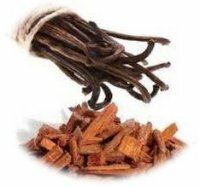 If you want sandalwood true smell go with the other 2 listed, you can get a woody or a sweet smell of sandalwood.